Put 25g hazelnuts, half the garlic and 50g rocket in a food processor and pulse a few times until roughly chopped. Add 125ml oil and the lemon juice then blend again until combined but not completely smooth – you want a pesto with a little bit of texture. Season to taste and set aside. Use a spiralizer to cut the squash quarters into thin ribbons (depending on the size of your spiralizer you may need to cut the squash into thinner wedges). If you don’t have a spiralizer, you can cut the squash into thin wedges then use a vegetable peeler to peel off ribbons. Heat the remaining oil in a large, wide pan, then add the squash ribbons and sauté for 2-3 mins – you may need to do this in batches. Add the remaining garlic and a splash of water to help the squash steam gently. Cook for 2 mins, trying not to stir too much as the squash may break up. Stir most of the rocket pesto into the pan (reserving some to serve) so that it just coats the squash and heats through. 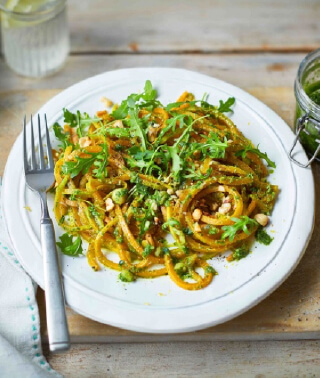 Divide the squash spaghetti between plates and top with the remaining rocket leaves, chopped hazelnuts and grated lemon zest. 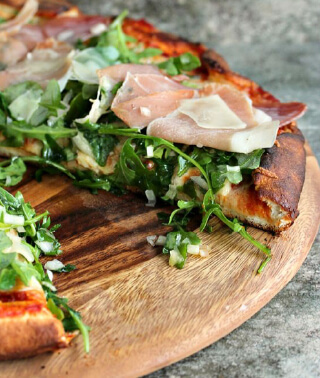 Drizzle over the remaining pesto and serve with a lemon wedge on the side to squeeze over. 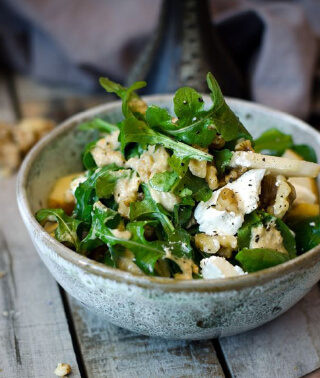 Tip: Butternut squash adds gorgeous colour and sweetness to this dish, but you could also try using courgetti or regular spaghetti if not catering to a gluten-free diet.